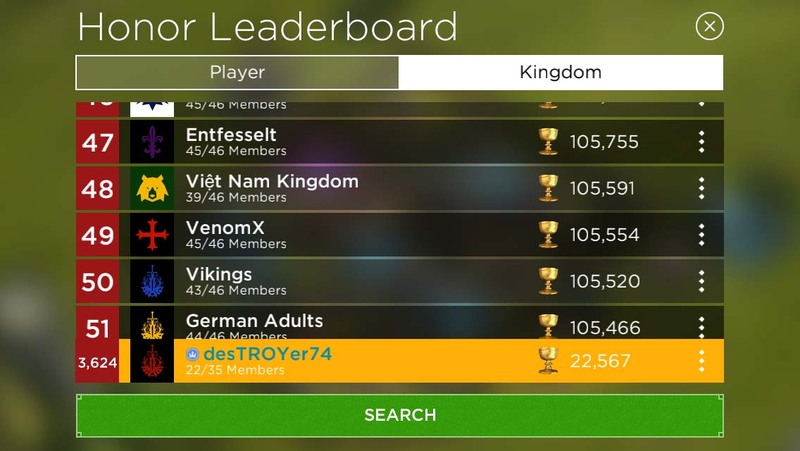 A Kingdom is a group of players who join together to help each other and to compete against other kingdoms in two main ways, climbing the honor (cups) leaderboard and gaining vital in game resources (e.g. rings) from winning battles in kingdom leagues. The lords and the king share the Kingdom leadership responsibilities. Only lords and the king can add/remove members, as well as assign kingdom roles (raider, sentinel, squire, commoner, and outcast). Including all the roles, a kingdom can have up to 50 members. The maximum number of members increases up to 50 through donations on the kingdom page. The kingdom page has a building that associate with each role. Donation to these buildings will either open up more spots for these roles, improve the roles and/or will yield loot benefits. Kingdom Fame is a measure of the progress of any given Kingdom and is earned by completing the above Kingdom Projects. The Kingdom feature unlocks once you have leveled up your Stronghold to Level 4. A guide quest “Banner” will also trigger to prompt you to join a kingdom. At Stronghold level 4, you can either create your own kingdom (cost 15,000 gold) or join an existing kingdom. You can find a kingdom via the Search feature. 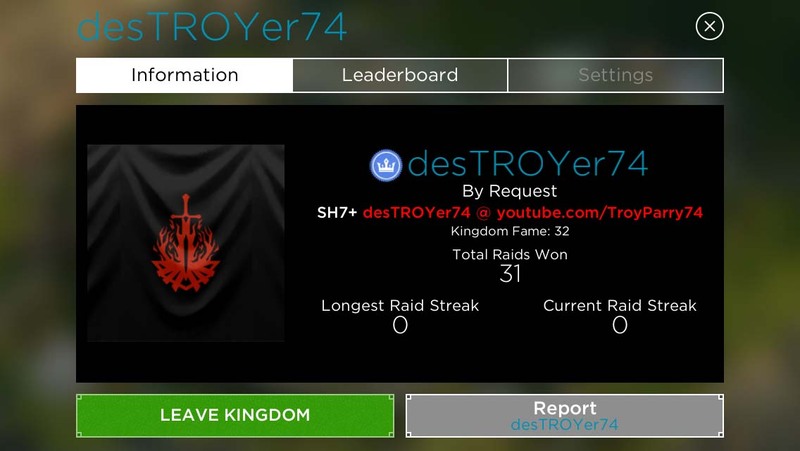 You can see kingdoms in the Leaderboards. Tapping on the kingdom name will open up the Kingdom Information page. Underneath the kingdom name will be a status “Open” or “By Request”. 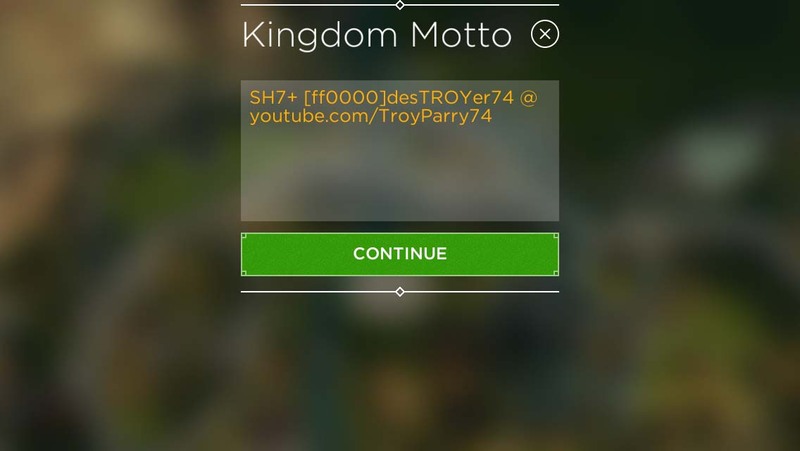 An “open” kingdom will allow anyone that taps “Join Kingdom” to join automatically. If the kingdom status is set as “By Request”, then tapping “Join Kingdom” will send a join request to that kingdom for their consideration. It’s always good to send a personalised message when applying to join a kingdom. If you are referred by a friend, be sure to include that information in the message. Some kingdoms will have a minimum Stronghold level requirement, be sure to read the kingdom message before applying. There are multiple ways to leave a kingdom. Selecting the “leave” command in the Kingdom Information page, which can be accessed by clicking on the Kingdom Menu. Requesting to join a different kingdom. A prompt “Are you Sure?” will appear, asking you to confirm whether you want to leave the current kingdom and join the new one. 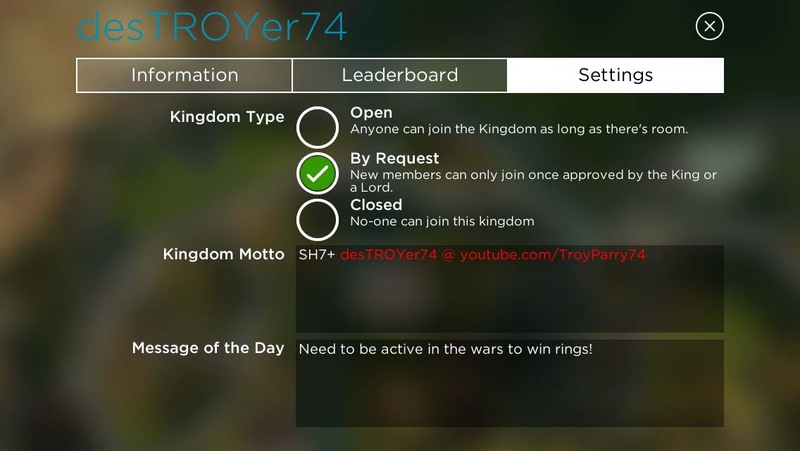 Clicking “yes” will remove you from your current kingdom and sends a request to join to the new kingdom. If you are the king, you can reassign a new king before leaving the kingdom. If you are the last member of the kingdom, upon leaving a warning message will pop up to remind you that you won’t be able to rejoin an empty kingdom. Some kingdoms will remove inactive players. The period of inactivity varies from kingdom to kingdom. Leaving a kingdom in middle of a Kingdom Raid will cause the kingdom to lose any raid points you contributed. You will also forfeit any rewards from winning the Kingdom Raid and the Kingdom League. The success of a kingdom, as determined by the position of that kingdom on the global leaderboard is a product of kingdom management. The responsibility of kingdom management typically lies with the King and the Lords of the kingdom. The Kingdom creation feature is enabled once you have reached Stronghold level 4. As the creator of the kingdom, you will be the first member and the king of the kingdom. Tapping the “Kingdom” button on your home screen will take you to the a map of your kingdom. Tip: pinch the kingdom map to zoom in/out to show more/less details. Choose and change the kingdom banner. This can be done by tapping on the “picture icon” next to the kingdom name. Approve/decline request to join the kingdom. Promote/demote kingdom members by assigning roles. Kick members from your kingdom. This can be done by clicking on the portrait of the member that’s to be removed. Set kingdom join status as either “Open”, “By Request” or "Closed". Set and edit the "Kingdom Motto". This will appear in the Kingdom Information screen for everyone to see. Set the “Message of the Day”. Enter any important communication that all members should read. This message will be pinned in Kingdom chat. Tip: To add colour to your Motto/MotD, use RGB colour codes embedded in square brackets (no trailing space) as shown in the image below ([ff0000]). Choose the kingdom name carefully, as it cannot be changed again once the kingdom has been created. You may wish to set your kingdom status as “Open” initially to let it fill up more quickly. There are a total of 25 open spots for a newly created kingdom. Donation to the projects on the kingdom map will open up more spots/roles for your kingdom. The King can make another member the King by first tapping on the Kings "picture icon" above the Kingdom Menu, then selecting "Change Player". There are several roles in a kingdom that are key to the building up of the kingdom. Lord/Lady. This is a kingdom leadership role. As a lord, you will be able to perform a subset of the king’s administrative duties, such as adding/removing, promoting/demoting members, and setting the “Message of the Day”. However, you will not be able to demote or promote a fellow lord/lady (only the king can do so). Sentinel. This role is typically given to kingdom members with the most difficult base for attackers to defeat. The role itself does not carry any kingdom management abilities, but it carries a permanent health bonus (which starts at 10% and increases with kingdom donations up to 30%). This role adds bonus hit points to all buildings and walls during kingdom raids. Squires. A Squire's base is shielded from attacks during a kingdom raid. Squires can, however, attack in raids. This role is typically given to lower level players in the kingdom. Squires also do not have any kingdom management abilities. Raiders. Raiders are able to loot extra gold from normal battles (which starts at 10% and increases with kingdom donations). This role is typically given to members who are either trying to level up or as a reward for their kingdom donations. Commoners. This is the default role in a kingdom. Players not assigned another specific roles are commoners, which are the majority of members in a kingdom. There are no privileges or bonuses associated with this role. Outcasts. The purpose of this role is yet to be determined. It is possible that certain restrictions may come with this role at a later update. Currently, this role has no special functions that exist in game and, thus an outcast is essentially a commoner at the current time. Kingdom leaders (lords/ladies & king) have special access to a private chat channel. This is where important kingdom decisions, such as promotion/demotion are discussed. In some kingdoms the leadership team extend to include sentinels and raiders. The exact setup of the kingdom leadership team varies from kingdom to kingdom. Only the leadership team can start a kingdom raid. Donation to kingdom projects are vital to unlocking more spots for the following roles: lord, sentinel, squares, raiders, and commoners. Name of the building and it’s purpose. Level of the project and it’s progression to the next level. Portraits of all members who have donated to this project. The “Help Upgrade” button with a gold or ring amount next to it. A cool down period timer, showing when you can donate to this project again. This cooldown can be skipped by paying diamonds. The loyalty points (LP) earned from donating to this project. Loyalty points can be used to purchase “Loyalty Chests” from the shop menu. Your total gold donation to this project. The top contributor of this project and the amount they have donated. Farm. Donation to this building will increase the size of maximum kingdom members you can have. The maximum number is set at 50. Council Hall. Donation to the council hall will level up the project. Each level will unlock a new lord/lady spot. The maximum number of lords/ladies a kingdom can have is 6. Gatehouse. The number of sentinels a kingdom can have is increased by donation to this project. You can have up to 4 sentinels per kingdom. Squire Training Donations here will unlock more squire roles. The maximum number of squires per kingdom is currently set at 4. Raiders’ Guild. Donation to this project will unlock more raider spots to be shared around. Kingdom Troop Portal. This building allows member of the kingdom to donate troops to each other. Leveling up this building will level up your Kingdom Portal, enable you to donate and receive more troops. Watchtower. Donation to this building will increase the sentinels’ health making them a tougher opponent in the raid. Tavern. Raiders can loot more gold (i.e. a higher percentage from the opponent's base), as this building levels up. Royal Mint. The lords and the king of the kingdom will receive more gold through smelters as this building levels up. Kingdom troop portal, allowing more troop donations amongst the kingdom members. Squire training. The sooner squires are unlocked, the sooner you can protect low strongholds from the raid. All Projects have a 3 hour donation cooldown period. The cooldown can be skipped for 132 diamonds. The Loyalty Points you earn from your Kingdom can be spent on Silver Loyalty Chests which can be found in the Shop → Chests menu. The Silver Loyalty Chest contains the exclusive Ancient: Aegis. Note: Duplicate Common/Superior Ancients will be converted into 5,000 elemental Primus, and 7,500 Primus for duplicate Rare/Epic Ancients. You can access the Kingdom Honor Leaderboard by tapping the trophy icon in the bottom left corner of your village. The honor from your top30 kingdom members will contribute to the Kingdom Honor Leaderboard scores. Kingdom honor is calculated using this formula: (top1-10 players honor x 1) + (top11-30 players honor x 0.5). Note: the Kingdom Honor Leaderboard is not updated in real-time. Creating a new Kingdom is a lot of hard work, but at the same time very rewarding. As a King or Queen, it can initially take you a while to attract new members to join. Maybe you have some friends that can come help, and maybe they have friends too. Another way to attract new members is to advertise in the Global Chat. Note that there are many global chats, so it could be beneficial to have several members advertise from their global chats too. It's best to try and find members around your own Stronghold level or higher, so you can grow strong together. Allowing much lower stronghold members to join can be a weakness as they are easy points for the enemy kingdom during wars. You can squire the lower level players, however these positions are in limited supply. Most Kingdoms fall into 2 categories. A local Kingdom, where most of the members are from a similar time zone, and an international Kingdom, where members are from all around the world. Both of these have their pros and cons, so let's look at them now. In a local Kingdom, people will typically be all online during the same hours. This is great for socialising, however there may be a lot of contest over who gets the Raider roles, or Sentinel roles. It may be best to create a schedule and assign these roles to different players on different days of the week. Due to the high activity, it should be fairly easy to fill donations. During Kingdom Wars, there should also be plenty of members online to share attack strategies. In an international Kingdom, less people will be online at the same time. This can be a strain on Lords being available to assign active members with Raider roles, or Sentinel roles when shields are expiring. To get around this, the King would need to rotate active Lords throughout different times of the day, and possibly even assign a different King when they aren't available to manage the Kingdom. Kingdom donations may take longer to fill, and there might be less members around to help with attack strategies during Kingdom Wars. One of the things most people look forward to, is Kingdom Wars. As soon as you have enough members, you'll want to start doing these regularly. Move your weakest members into Squire roles, they won't be included in the line-up, but they can still attack and contribute raid points. Move your strongest players into the Sentinel roles, they are guaranteed be in the war line-up, plus they receive bonus hit points, making them harder to beat. Encourage members to use all their 5 Morale to get as far as possible. Share replays to help other members defeat each base. Help out with troop donations. Encourage members to use Kingdom Troops and battle boosts to win the war. In order to become a stronger kingdom, you'll need to donate to Kingdom projects to improve perks such as higher member count, more Sentinel roles and higher HP bonus etc. The higher your project levels, the more likely you'll attract new members to join. Farm, Squire, Sentinel and Kingdom Troop Portal projects are the main roles which will help during Kingdom Wars. Certain upgrades will give your whole kingdom perks, read more about these here. Once you've built a strong kingdom, you'll also need to maintain it to keep it that way. Make sure you only keep active members. This will ensure a high contribution during Kingdom Wars. Monitor donations - keep an eye out for low donations, this can be a good sign of low activity. Monitor raid performance - when the raid day ends, check for low scorers, and people that didn't use their 5 morale points. Rotate active Lords so they can assign Raider and Sentinel roles to members that request them. Keep in touch via chat apps like Line - this is a great way to communicate with all members to keep them up to date with what's happening in the Kingdom. Have internal contests - some examples might be to see who can slay the king first, or donate the most to a Kingdom project. Assign roles such as Lord, Raider and Sentinel based on the highest weekly contributions.